Nurses Present Palin Clothing Line Website...and other ways the money could have been spent. What else could you do with $150,000? That's the sum the Republican National Committee famously spent on wardrobe and makeup for Gov. Sarah Palin. Contrast that with a registered nurse who can be outfitted in scrubs for just $10 for a hospital shift. "The same $150,000 would outfit 15,000 RNs in scrubs," notes Geri Jenkins, RN, co-president of the California Nurses Association/National Nurses Organizing Committee which sponsored the site, www.DressLikePalin.com. "How disgraceful at a time when so many Americans are struggling to pay their medical bills or keep their homes," Jenkins noted. "Spending $150,000 for a one month wardrobe while painting yourself as a 'hockey mom' or the voice of 'Joe Six Pack' is an insult," said CNA/NNOC Executive Director Rose Ann DeMoro. "There's been a lot of talk about Marxists in this campaign, but the real Marxist is in the McCain camp – she's just a Neiman Marxist," said DeMoro. "Real working people live and dress far differently," DeMoro noted. The $150,000 shopping spree amounts to, as one writer put it, more than the average American household spends on clothes in 80 years. The same $150,000 could buy 15,000 chef coats, 5,769 painter's bibs, 5,000 police shirts, 4,687 auto mechanics' coveralls, 3,750 pilot uniforms, or 3,571 housekeeper uniforms. DressLikePalin.com lets internet browsers see other ways you could spend the money. The $22,800 the RNC spent on makeup, for example, would pay for 224 mammograms, 651 flu shots, or provide a supply of cholesterol lower Lipitor for one person for nearly 14 years. And that stylish $2,600 Valentino jacket would cost an average teacher one full month salary – or pay the full winter natural gas heating bills for two Midwest families. The garish amounts devoted to Palin are not an anomaly for the McCain campaign. At the republican convention last month, Cindy McCain was attired in a wardrobe estimated to cost as much as $313,000 – a figure that exceeds the median price of a house in Miami, Baltimore, Los Angeles, Las Vegas, Phoenix, Milwaukee, Minneapolis, Atlanta, New Orleans, and St. Louis. It would buy you nearly three homes in Akron, Ohio or Erie, Pa., or four homes in Youngstown, Ohio. CNA/NNOC is the largest and fastest growing organization of RNs in the U.S. with 80,000 members in all 50 states. The nation’s largest union of RNs will launch a campaign this Friday to reach healthcare voters in the key battleground states of Ohio, Pennsylvania, New Hampshire, Maine—and to make sure they have the information they need about the healthcare proposals debated in this election. The tour will feature a unique wrapped bus--a striking visual--emblazoned with report cards on the candidates’ healthcare proposals. This “Drive for Battleground Healthcare Voters” road show will carry local nurses, physicians, patients, healthcare activists, and Donna Smith, a star of the movie SiCKO, to a variety of public events along the route. The nurses are also reaching out to a target universe of voters interested in healthcare through a mail piece featuring the healthcare report card; through a broad phonebanking campaign with nurses calling these same voters; and with local advertising buys. The campaign is focused on the nation’s leading battleground states. From Oct. 24 through Nov. 1, they will tour Cleveland OH, Akron OH, Youngstown OH, Erie PA, Pittsburgh PA, Greensburg PA, Philadelphia PA, Wilkes-Barre PA, Scranton PA, Manchester NH, Derry NH, Rochester NH, and Bangor, ME, and in Northern Virginia and Richmond, VA. The road show toured Nevada for the week of Oct. 13 to 17. The Drive is sponsored by the National Nurses Organizing Committee (NNOC), which is the nation’s largest RN union, along with the California Nweb urses Association (CNA), Massachusetts Nurses Association (MNA), Maine State Nurses Association (MSNA), Pennsylvania Association of Staff Nurses and Allied Professionals (PASNAP), and NNOC-Ohio. “RNs know that patients and voters need specific and independent information about the healthcare records and proposals of politicians. Healthcare is an issue that touches the lives of every single American, and we have seen significant debates in this campaign about its future. We are committed to getting this important information into the hands of every Nevada voter,” said Geri Jenkins, RN, co-president of NNOC/CNA. 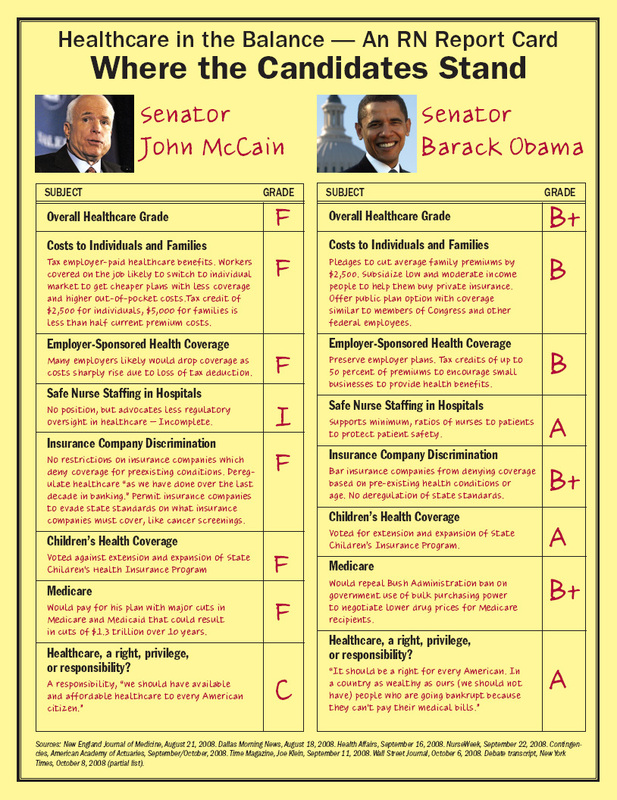 Key issues highlighted by the RNs include John McCain’s plan to tax healthcare benefits for the first time in American history, as wall as Barack Obama’s endorsement of safe nurse-to-patient ratios, a patient safety provision that will save thousands of lives a year. On Oct. 13, registered nurse activists from the state of Nevada and around the country will launch a drive to make sure voters in Nevada, Ohio, Pennsylvania, New Hampshire, Maine, and elsewhere have the information they need to be informed healthcare voters. The Nevada leg of this tour will be coordinated by NNOC Nevada, the state affiliate of the National Nurses Organizing Committee/California Nurses Association, the nation’s largest RN union. The centerpiece of the Nevada drive will be a statewide bus tour Monday Oct. 13 through Friday Oct. 17, visiting Sparks, Carson City, Reno, Incline Village, Gardnerville, Lovelock, Elko, Ely, the Shoshone Reservation, Las Vegas, and Henderson. The campaign kicks off Monday at 10:30 a.m. in Sparks with workers and labor leaders decrying the healthcare crisis that is sickening and impoverishing our nation. WHEN: Monday Oct. 13, 10:30 a.m. The tour will feature a unique wrapped bus—a striking visual—that includes the nurses’ report cards on the candidates and their healthcare stances. Riding the bus will be local nurses, physicians, patients, healthcare activists, and Donna Smith, a star of the movie SiCKO. NNOC is also reaching out to voters through a mail piece featuring the healthcare report card that is going out to swing voters across the state, especially unaffiliated women; with a broad phonebanking campaign with nurses calling these same voters; and with print advertising. “As an RN right here in Nevada, what you call voters, I call my patients. My colleagues and I will make sure they have the information they need to make good decisions about the healthcare proposals of the leading presidential candidates,” said Michael Collins, an RN in Las Vegas. “RNs know that patients and voters need specific and independent information about the healthcare records and proposals of politicians. Healthcare is an issue that touches the lives of every single American, and we have seen significant debates in this campaign about its future. We are committed to getting this important information into the hands of every Nevada voter,” said Malinda Markowitz, RN, a co-president of NNOC/CNA. Following the Nevada leg of this tour, NNOC plans to continue the October road show with stops throughout Ohio and Pennsylvania, as well as in Manchester, New Hampshire and Bangor, Maine.